Among the rescuers of Jews during the Holocaust were Armenians - some of them motivated by the memory of the atrocities committed against them at the beginning of the 20th century. These acts of rescue took place where the Armenians fled subsequent to the genocide - Ukraine, Crimea, France, Hungary, and Austria. Christian conduct during the Holocaust continues to challenge the Christian world well into the 21st century. Many factors played a role in influencing the behavior of church leaders and clergy when confronted with the murder of the Jews. Some spoke out against the persecution, others remained silent, many acquiesced, and some even collaborated. A few – from all Christian denominations – risked their lives to save Jews. As Nazi Germany intensified its anti-Jewish policy, increasing numbers of Jews were driven to flee and to seek ways to emigrate. Long lines of desperate people seeking visas formed in front of foreign consulates, but the free world was reluctant to permit entry of the many refugees. Most diplomats continued to employ ordinary procedures in extraordinary times; only very few proved to be an exception and faced with the refugees’ plight, were willing to act against their government’s policy and instructions and suffer the consequences. While indifference and hostility towards the Jews were the general rule in Nazi occupied Europe, there were always a few who risked their lives to help the persecuted. Among the Righteous Among the Nations there are also Muslims from Albania, Bosnia, Turkey, countries of the former Soviet Union. and an Egyptian doctor residing in Berlin. They were young girls of very modest or poor background, who had to leave their parents’ home at an early age and go to work taking care of other people’s households and children. When the war broke out the situation often changed overnight and a reversal of fortunes took place: the Jewish employers were stripped of their status, assets and rights and became helpless victims to persecution and murder, and it was the nursemaids who, despite the danger, their young age and lack of education, took charge and assumed full responsibility for the Jewish families’ survival. Rescue acts were by their very nature performed in secret. The danger of denunciation was great, and Jews had to be hidden not only from the perpetrators, but also from neighbors. Yet, in several places organized rescue was put in place, with rescuers joining together and pooling their resources and efforts. Sometimes these groups were part of organized resistance movements; in other cases they were spontaneous. On January 27, 1945, Soviet troops entered the Auschwitz-Birkenau extermination camp, the last such camp still functioning. They found 7,000 survivors. Another 50,000 inmates had been marched out several days earlier by the camp’s staff in order to prevent them from falling into Allied hands. Most of them perished before the war ended. Auschwitz, where over one million people – most of them Jews — were killed, has become a symbol for the Holocaust and for evil as such, and rightly so. For the Jewish people, it is the largest Jewish cemetery in the world, a cemetery without graves. And yet, even within the horror that was Auschwitz, there were flickers of light. Despite the total dehumanization that was part of the camp system, there were remarkable acts of solidarity and humanity by camp inmates. Among them were non-Jews, who at risk to their own lives, sought to ease the pain, to give aid and to rescue Jews. They proved that even within the brutality and the murder, people could choose not to remain indifferent. These non-Jews are among the more than 21,000 who by 2006 have been recognized by Yad Vashem as Righteous Among the Nations. 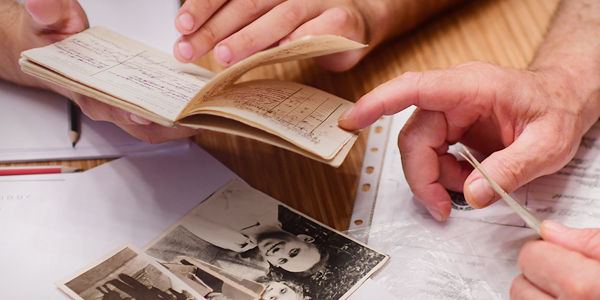 Since 1963, as mandated by the Israeli Parliament, Yad Vashem has honored those non-Jews who, during the Holocaust, saved Jewish lives in circumstances that posed a risk to his or her life, without intending to receive a reward, monetary or otherwise. We bring you here six of their stories. These Righteous Among the Nations, who risked their lives to save Jews during the Holocaust, and are featured in this unique exhibition, embodied the Olympic spirit by dedicating their lives to "social responsibility and respect for universal fundamental ethical principles". (taken from the Olympic Charter). In order to perpetrate the murder of six million Jews it was necessary to enlist the cooperation of different state institutions. Many of those involved were, so they claimed, professionals merely doing their job. Only a small minority mustered the necessary courage and honesty to recognize the real significance of what they were doing or what they were required to do and decided to defy their superiors and their orders and instructions. About One and a half million Jewish children perished in the Holocaust. Every child, every baby was targeted – only because they were born Jewish – in the attempt to annihilate the Jewish people. A whole generation was killed; only a few survived. In trying to save their children, parents often had to take the painful decision to part from them; other children were hidden after their parents were deported or killed. In a Europe where Jews were ostracized and targeted for murder, most people abandoned their former neighbors, and only a few stood by their side. The price that rescuers had to pay for their actions differed from one country to another. In Eastern Europe, notices were put up threatening those who helped Jews and their families with death. In Germany and Western Europe punishment was generally less severe. However, witnessing the brutal treatment of the population and the perpetrators’ determination to hunt down every single Jew, people must have feared that they would suffer greatly if they attempted to help the persecuted. Moreover, in many places rescuers had to beware not only of the authorities, but there was a great risk of denunciation on the part of their neighbors. A little over half of the Righteous Among the Nations recognized by Yad Vashem are women. While many of them acted in cooperation with other family members, some of these courageous women were the initiators of the rescue and acted independently to save Jews. Here are some of their stories. Featured here are several dozen stories of Righteous Among the Nations arranged by topics and by countries. All the Righteous Among the Nations recognized by Yad Vashem are included in the Database of the Righteous.